TERRE HAUTE, Ind. – Honey Creek Middle School captured top honors for a 23rd-consecutive year at the Wabash Valley regional MATHCOUNTS competition hosted by Rose-Hulman Institute of Technology on Saturday. Woodrow Wilson Middle School finished second and Greencastle Middle School took third. Also competing were students from Otter Creek Middle School, Terre Haute Christian Home Educators, Saint Patrick School, Sarah Scott Middle School, and West Vigo Middle School. Honey Creek mathletes filled eight of the top 10 positions in individual scoring led by Honey Creek’s Brady Exoo. Jayce Dix and Christine Liu, both of Honey Creek, finished second and third respectively. Rounding out the top ten were Samhita Shantharam (Honey Creek), Alice Howard (Greencastle), Justin Zheng (Honey Creek), Christopher Chow (Honey Creek), Pavaan Kumar (Honey Creek), Michael Tanoos (Woodrow Wilson) and Landon Grahek (Honey Creek). Completing the top 17 scorers were Hunter Miller (Greencastle), Ben Walker (Woodrow Wilson), Raghav Bakshi (Honey Creek), Jessica Kallubhavi (Honey Creek), Ryland Hayes (Woodrow Wilson), Eric Grassick (Otter Creek) and Josiah Beachy (Terre Haute Christian Home Educators). Around 140 Wabash Valley middle school mathletes took part in the competition, which is hosted each year by Rose-Hulman. The top 17 individual scorers and top three teams will advance to the state MATHCOUNTS competition March 9 at Purdue University. Top finishers at the state will advance to the national MATHCOUNTS competition in Orlando, Florida in May. Organized by the Francis Vigo chapter of the Indiana Society for Professional Engineers and Rose-Hulman, MATHCOUNTS is one of the nation’s largest and most successful education partnerships promoting academic and professional opportunities for sixth, seventh-, and eighth-grade students. Each student participates in three rounds of competition: Sprint, testing quickness to solve problems; Target, testing problem-solving skills; and Team, testing teamwork abilities. 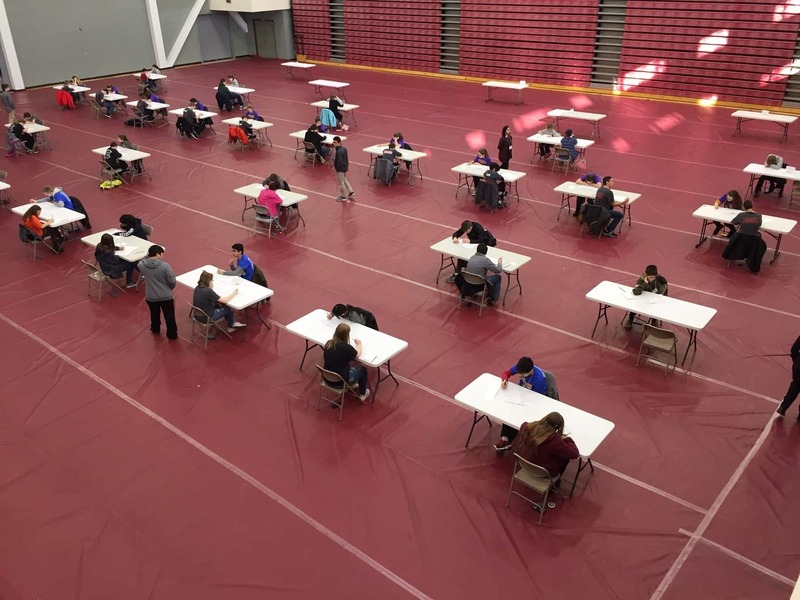 Students compete in three intense rounds of tough math questions in the Wabash Valley regional MATHCOUNTS competition Saturday in Hulbert Arena at Rose-Hulman.